Size 48w x 96h x 110d mm. Settings Using front panel feather touch (tactile) key board to set various parameters. Ramp or Soak Steps 1 to 16 Steps. Soaking Time Pd 1 minute to 99Hour.59Min. Program Hold Facility dHLd Manual Hold or Auto Hold (Hold back feature for guaranteed Ramp/Soak facility). Supply (90-250) VAC, 50/60 Hz. Panel Cutout 45 x 92 mm. +/- 0.5 mm. Enclosure ABS plastic with polycarbonate front graphic. Note Due to continuous improvement - the specifications are subject to change without notice. Control Algorithm PID or ON/OFF selectable (when specified for switching output). Tuning Manual tuning of PID values. 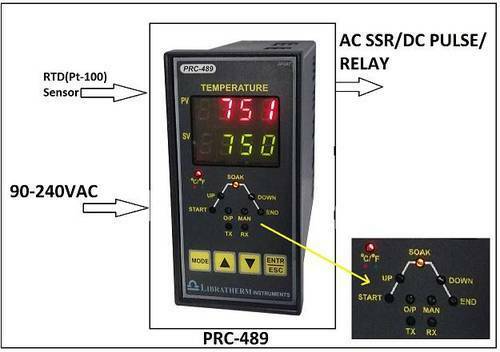 Libratherm offers Microcontroller based multiple Ramp / Soak programmable PID temperature controller Model PRC-489 which is designed to improve reliability, accuracy and control for all temperature control applications. It features Ramp and Soak functions (the capability to control the temperature and its rate of change over a predetermined time span). Single pattern of total 16 (ramp/soak) steps can be programmed and stored in the memory. It can also be used as single set point control when the ramp/soak profile control is not desired. PRC-489 offers both switching outputs in the form of SSR driver/Triac (AC SSR) for external SSR or external load contactor and analog output in the form of (4-20) mA or (0-5) volt control signal, which can be used to control heater power through external Thyristor power regulator. The analog outputs can be directly connected to Libratherm make single phase / three phase SCR based phase angle or zero cross over fired power regulators. Additional one/two relays are also provided for time or temperature dependent event outputs as per the system requirement. The programmed profile and other parameters are retained in the nonvolatile memory in the event of power failure. In case of thermocouple break, the control can be transferred to manual mode to continue the heating cycle and user can alter the % of control output. The deviation hold feature assures guaranteed ramp. For quick heating from ambient temperature the hold feature is disabled in the very 1st ramp. Front Panel LED indicates start and end of the cycle, the status of heater output, status of heating ramp, soaking or cooling ramp. The unit of temperature measurement can also be selected as oC or oF as desired. Accepts standard type of thermocouple, RTD, Voltage or Current signal. Control output of Relay / TRAIC / DC pulse / (4-20)mA / (0-5)Volt. Servo start from the current process temperature. 1 to 16 programmable ramp/soak steps with rate programming facility. Master / Slave concept with 1 master and max. 30 slaves. Each controller can be configured as master or slave with 1 master and many slaves. Can be used as single set point control with online set point change facility. Libratherm Instruments is one of the manufacturer, supplier and exporter of digital and microprocessor based electronic process control instruments like digital temperature controllers, digital temperature indicators, pid temperature controllers, pid controllers, temperature indicators, thyristor power reglators and temperature transmitters since its inception in 1991. The products of the company are economically priced, elegant in looks, reliable and excellent in quality. Due to its unmatched quality in products, the company has achieved a global recognition in a short span of time. Our key strengths are customization to meet customers end application. We understand the requirement of process control application and propose suitable cost effective solution using our electronics products. If need arises, we design and develop new product to meet the application to customers 100% satisfaction. We are known in the industry as solution provider to enhance the performance and productivity of the customers requirement. Since last 25 years We have been catering to various customers from various Industrial verticals. For Steel Industry We have been offering Molten metal temperature measuring systems and 4inch or 8 inch size display indicators. Pharma industries for Clean room monitoring of T+RH+DP, and suitable thyristor power regulators for heaters and T +RH PID controllers for AHU control application. For Automotive industries We have specially designed thyristor and PID based temperature control panels for Aluminium die casting systems. For Glass industries We have been offering thyristor based temperature control panels for pre heating of Glass melting furnace oil. For Plastic industries We have been supplying temperature control panels for injection moulding, extrusion lines and blow moulding machines. For Post weld heat treatment and for Stress relieving heat treatment applications we have specially designed profile controller and thyristor based multizone control systems and widely used by the Industry. For ceramic industries we have been offering our two phase thyristore power regulators and Ramp/Soak profile temperature programmer for high temperature furnaces using R,S or B type thermocouples. For Diamond studded Jewellery manufacturers, We have been offering Ramp/Soak profile programmer and ready to use temperature control panels for wax burnout furnaces and investment casting applications.